The 2017 Family Spending data was released today. 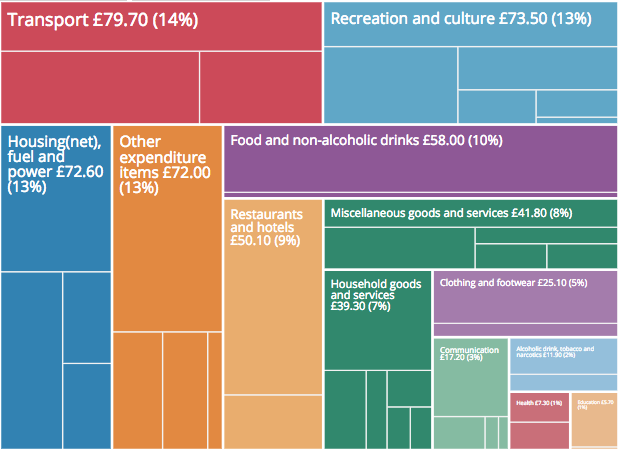 For the past three years the bulletin has been accompanied by an interactive treemap, which visualises all components of household expenditure. This treemap is embeddable allowing it to be easily syndicated by anyone interested in the data. Embedding the interactive is straightforward and Henry Lau has written a great post on how to do this. The treemap also creates custom urls, which can be used to show particular views. 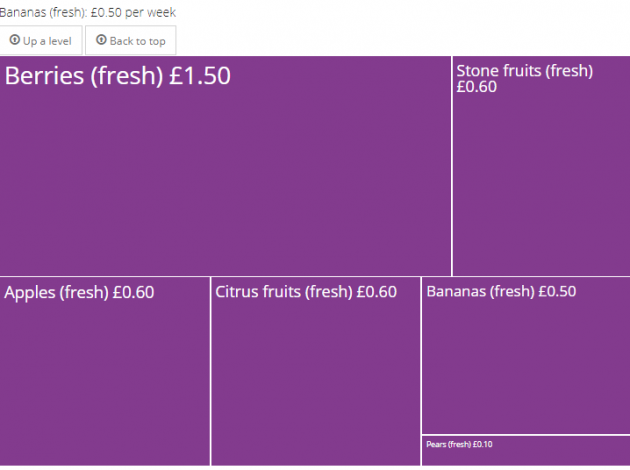 For example, say I’ve written some text about how much households are spending on bananas a week, it would be great to include a view of banana spend. I could do this by taking a screenshot of the treemap. However, this removes the context of how much people spend on other items. What might be a better solution is to embed the whole treemap and be able to show people how you reach the view that specifically focuses on bananas. If you visit the page where the treemap is hosted, https://www.ons.gov.uk/visualisations/dvc465/treemap/index.html, you’ll notice that as you click on a section to zoom in some extra code appears in the url. Clicking on the transport section gives #c7, communication is #c8 and clicking on the food and non-alcoholic drinks section all the way down to bananas gives #c1/c1_1/c1_1_19. To embed a responsive graphic, you need to use pym on the site you’re embedding on (the parent) and the page you’re embedding (the child). This is quite simple to do if you can add scripts to your page. Again, you can read more about using pym.js in Henry’s blog and also see more data visualisation examples using this approach on Visual.ONS. How do you embed your content?